A blueprint for Biddulph’s new £1.175 million joint fire, ambulance and community facility was showcased in the village on November 4. 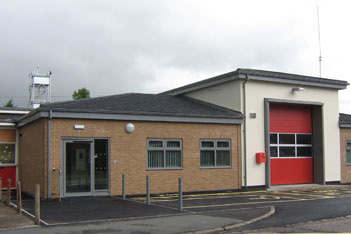 Residents were invited to attend one of two drop-in sessions at the community fire station on Princess Street. The events were an opportunity for the community to have an informal chat to members of Staffordshire Fire and Rescue Service who are based in locally. An on-duty paramedic also called in throughout the day and the project team were available to answer visitors’ questions about the development. Community feedback will be used to help decide which services will operate from the new facility in the future. Staffordshire Fire and Rescue Service and West Midlands Ambulance Service were the first to sign up to the venture and talks are continuing with other partners who may potentially want to join them. Biddulph Station Manager Carl Mason said: “We are always looking at ways to work more efficiently and effectively with our partners so that we can continue to provide a first class, integrated service for the benefit of our local communities. This joint facility is just another example of how we are working closely with our partners in the health service to provide a multi-agency approach to protecting the most vulnerable members of the community.” A Government grant is funding the initiative. It was one of 37 awarded through the Fire Transformation Fund last October. Plans to demolish an adjacent building next to the community fire station to allow it to be extended have now been submitted to Staffordshire Moorlands District Council. The planning authority will discuss the proposals in December with a view to work starting on the project early next year with completion in the summer.